The Batbox cabin (built in 2016) is a bespoke studio space with an interior of 26sqm including a shower/wet room plus covered deck. 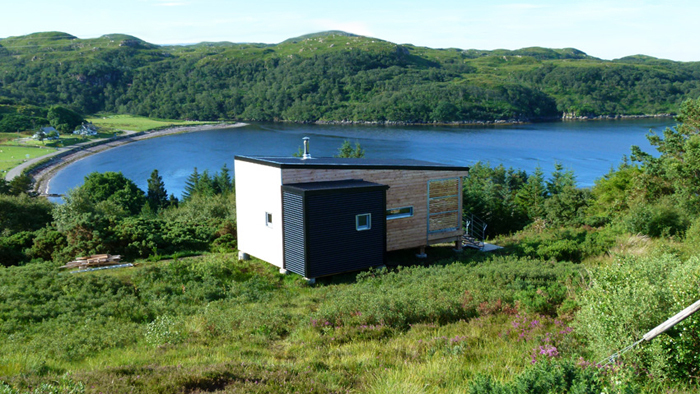 See the Pictures page for up to date titled images of both cabins, the croft and surrounding area. Similar to Lazybed cabin in concept, the Batbox cabin is a high specification, cosy, one double bed self-catering eco unit designed to accommodate up to 2 guests. Once again the design and build is all down to our good friends at North Woods Design. 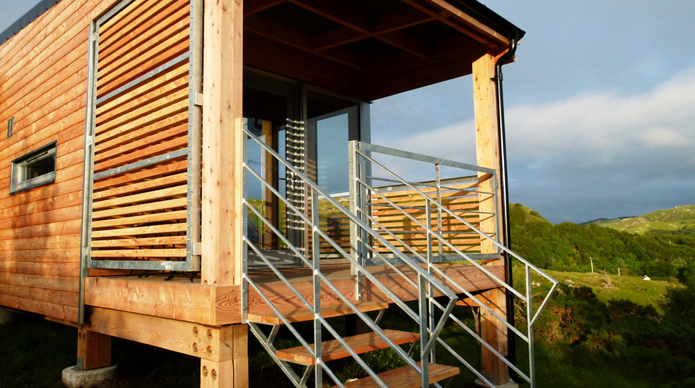 The Batbox cabin is privately located on the east side of our bungalow and about 65 metres from Lazybed and the car park, with wonderful views to Cul Mor and across Inverkirkaig Bay. Access is via an undulating footpath through our woods and garden. The accommodation has a bespoke, compact and well equipped kitchen. There is a full size larder fridge, but no freezer (we can store items in our freezer if necessary). For cooking there is a Dualit mini-oven and a separate 2 ring induction hob. Please note there is no microwave. We offer a laundry service as there is no washing machine in the cabin, plus we have a drying room in our house for extremely wet boots and coats. The main living and sleeping area has oak flooring throughout with comfortable, functional furniture. There is no TV reception, but there is a flat screen television with DVD player and an eclectic library of films to choose from plus a good selection of books. There is a comfortable double bed with good quality bed linen. There is a hair-dryer in each cabin. There is bath and hand towel per person. If luggage space allows, we recommend that you bring along some indoor footwear. We ask you please to leave your shoes/boots outdoors, there is a storage box and coat hooks on the enclosed deck area. There is good Wi-Fi signal here, but not inside the cabin. Most devices pick up a good signal on the path (near our house) and in the car park. You are also welcome to use our home Wi-Fi or make (UK) landline calls with prior notice. Mobile reception is intermittent in the whole area of Assynt, there are some hot spots on the way and in Lochinver. Please note our 'complimentary' welcome pack on arrival includes: a couple of cold beers (or a non-alcoholic drink at your request), a small home baked (organic) loaf, excellent jam and (very important!) porridge oats. Also included in the tariff are day to day essentials such as tea, ground coffee, sugar, olive oil, salt and pepper, all this should last a couple of days. For the 2019 season we have decided to no longer include milk and butter as part of the small welcome pack. This is due, in part, to a lack of demand resulting in considerable waste. Thank you for your understanding.